A string of revelations over the past two years about the National Security Agency’s domestic and international surveillance efforts have brought new awareness to many Americans about online privacy and security concerns. Yet most American adults have not made significant changes to their digital behavior, and 54% say that it would be “somewhat” or “very” difficult to find the tools and strategies that would enhance their privacy online and when using cellphones, according to a Pew Research Center report. 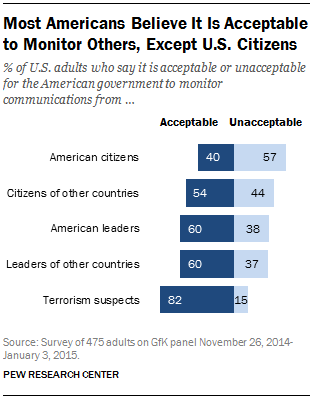 While only a minority of Americans (40%) feel it is acceptable for the government to monitor ordinary American citizens, many think it is acceptable to monitor others in a variety of other situations. Americans generally support the use of surveillance to investigate criminal activity, as well as circumstances when a person’s digital activity may raise suspicion of potential involvement with terrorism or violent acts. At the same time, respondents are split on other activities that might warrant closer scrutiny. Notably, this includes certain privacy-enhancing behaviors: 49% believe it is acceptable to monitor the communications of a U.S. citizen who has “used encryption software to hide files,” while 47% think this kind of surveillance is unacceptable. However, awareness of how these tools work and what they are used for may be relatively low. For instance, among a subset of respondents who had heard at least “a little” about the government monitoring programs, 31% said they didn’t know about email encryption tools.